HARARE – The government of Zimbabwe has defended the Zimbabwe National Army and the Zimbabwe Republic Police for using force against protestors in cities of Harare and Bulawayo. 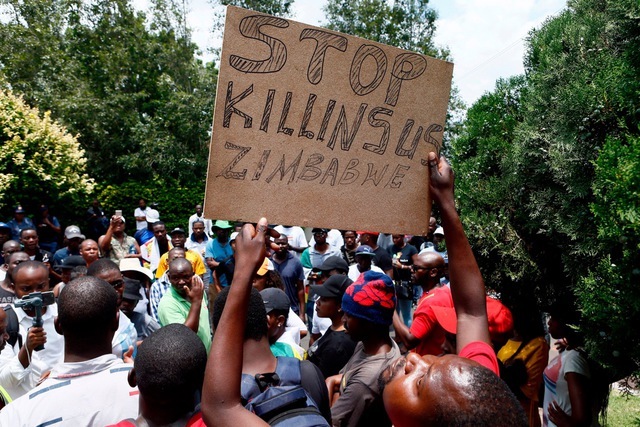 The Zimbabwe Human Rights Commission NGO forum inside the Western country reported that the defense forces used “systematic torture” against rioters. The military was seen beating a group of minibus drivers in the capital Harare. The commission also reported that the army got men and boys as young as eleven from their homes and beat them for over two hours. Incumbent president Emmerson Mnangagwa called for a national dialogue with opposition leaders MDC party who he blames to be the cause the ongoing unrest at home. However, the party declined to Mnangagwa’s call demanding that the government should first release its members it is holding in detention. Over Six hundred people have been arrested since the protests broke out including famous activist pastor Emma Mawalire who is also still in detention. Protests in Zimbabwe follow an announcement by president Mnangagwa where he almost doubled the price of fuel in the country in order to deal with shortages. Reports indicate that Mnangagwa tried to borrow two billion dollars from South Africa in order to revive the economy at home but South Africa was not in position to help. The increase, however, has made Zimbabwean fuel the most expensive in the world according to Global Petrol Prices.com.This rapidly increased transport fares that people failed to get to their workplaces. The situation in Harare is still unstable with the future even more uncertain as Zimbabwe’s economy continues drown day in day out.